Say goodbye to trawling through the local paper to find someone to fit the new bathroom, and surfing various websites to find a suitable firm to unblock the drain outside. No more frantic searching online to try and find a plumber to repair that burst pipe leaking water all over the house. One call is all it takes to have a full service plumber on the scene to deal with just about any plumbing task you have. We're the only professionals you need, so there's just one phone number to store in your address book - a number you know will cover all bases. Concerned that one plumber may not be experienced enough to handle a wide range of tasks from fitting a new tap washer to installing a complete new bathroom? Well, we've built a fine reputation throughout the Newton-le-Willows area for providing a wide range of services to many satisfied customers for many years now. They keep coming back, so we must be doing something right. 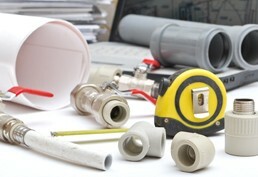 As well as the reputation for professionally providing a wide range of services, we're fully qualified plumbers. All staff are experienced and qualified in industry-specific ways such as Gas Safe registered. Feel free to discuss your requirements and ask any questions you may have - and see for yourself how affordable we could prove to be by asking for your free estimate.